You need to install Poppy softwares before installing the V-REP simulator. 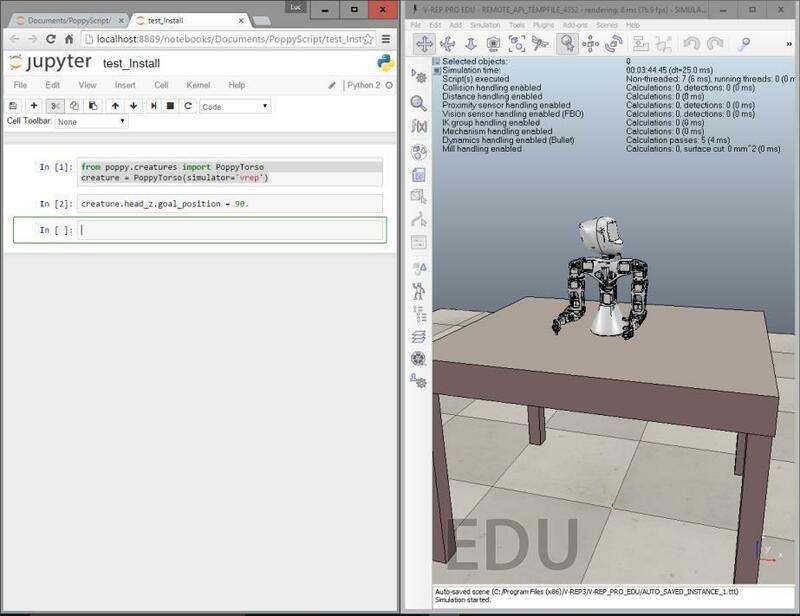 V-REP is an efficient robotic simulator mainly open source (GNU GPL), which is distributed under a free license for educational entities and have a commercial license for other purposes. There is also an PRO EVAL version which limit the right to backup. As you don&apos;t need to backup the scene to use V-REP with pypot (the Python library made for Poppy creatures), we suggest you to install this version to not worry about copyright infringement. If you want to modify the V-REP scene for adding or customizing a Poppy creature, you will have to use the PRO or the EDU version (look at the educational license). Download V-REP PRO EVAL or EDU (if you are an educational entity). As V-REP is not signed, you will have to pass the Windows SmartScreen (on Windows 10) popup to begin the installation. 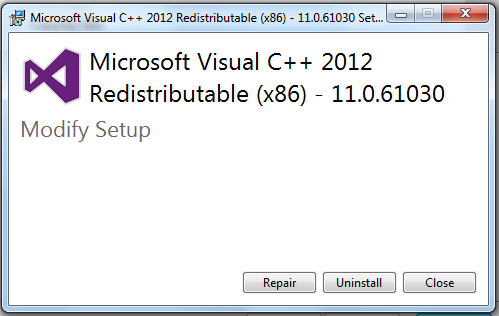 During the installation, make sure to install Visual C++ Redistributable 2010 and Visual C++ Redistributable 2012. Even if you already have Visual C++ Redistributable 2010 or Visual C++ Redistributable 2012, it is advised to "repair" them (it is a re-installation process). After the installation you can test if V-REP works well. This paragraph is not currently written. Your help is welcome to fulfill it ! After a one or two seconds, you will have an error like the picture below in your Command prompt. 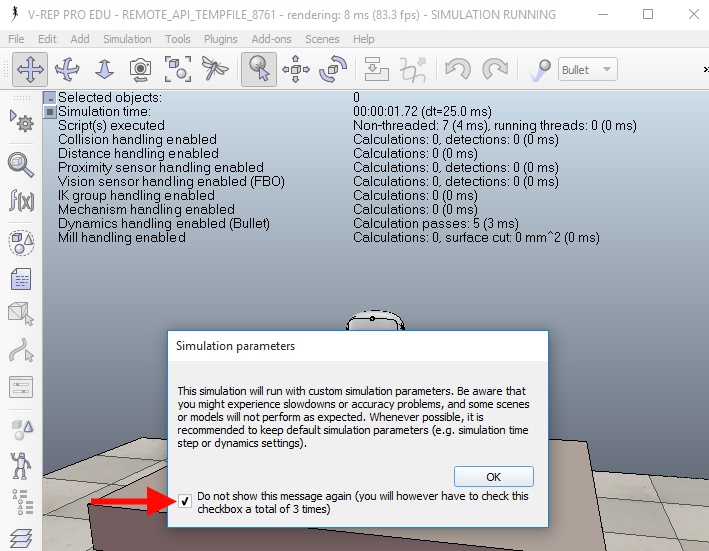 If you switch to the V-REP window, a popup appeared to inform you that the simulation use custom parameters. This popup block the communication to the Python API of V-REP. You have to check the check-box "Do not show this message again" and press "Ok". Switch the the command prompt window. You will have to execute the last command (poppy-services --snap --vrep --no-browser poppy-torso) and click again to the V-REP popup (with the check-box checked). This process will have to be done three times to make it works well! To avoid retyping the same command again and again, you can press the up arrow key to call the last typed line. When the setup of V-REP is ready, you can execute the last command without the "--no-browser" part. 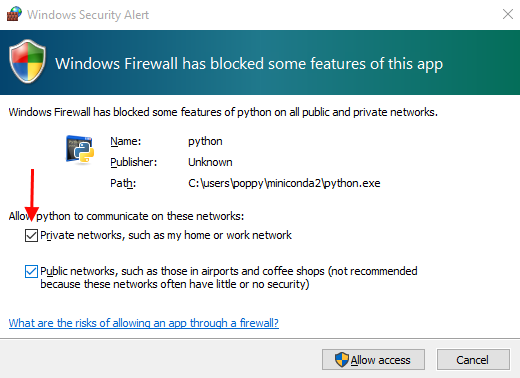 If you see a firewall popup like the picture below, be sure to check the "private network" check-box. If everything works, a new tab have been opened on your default web-browser. You can program you robot in Snap! or in Python.